Got the duvet but it doesn’t, open for me to put a comforter in. Is this the way it’s suppose to be? First time Ever ordered from Overstock. A casual awning stripe feels fresh and new mixing Apple Green with Chambray Blue and white. 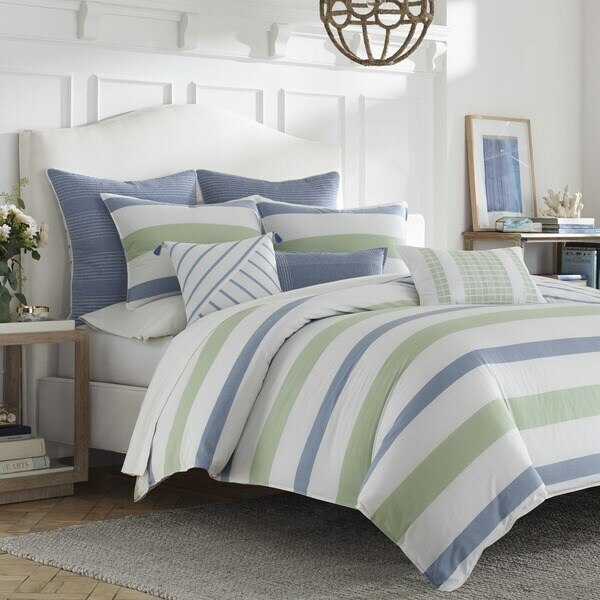 Adding a blue and white Breton stripe reverse print with pieced and embroidered stripes on accent pillows as well as textural stripes stitched on solid Chambray European shams reflects an important fashion trend for stripe-on-stripe layering. This inviting, all cotton ensemble is crisp and stylish, yet still casual and classic. We ordered this duvet cover to go in out guest room, and it is very nice, the colors are perfect, i love the double pattern on both sides, it is nice for when you get tired of one side, and you want something fresh, turn it over, and its like you have a new cover! The only downside is even straight out of the dryer, it is very wrinkled. It requires ironing, which for a guest room isn't so bad, but i wouldn't have this in a room where it is constantly used or it would need to be ironed ALL the time! Colors true to picture. Very satisfied.